Take your CleanPod where you need it on a flatbed trailer. They go where you need them – inside or out – when you need them most. The CleanPod was originally designed with, and for use by the US Navy. 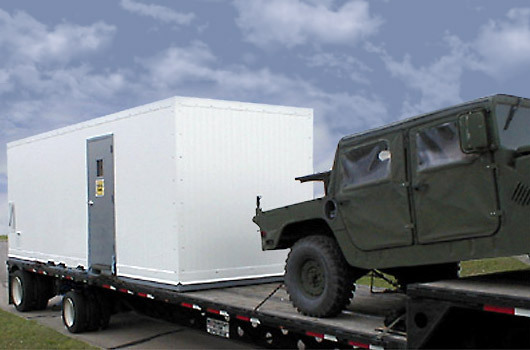 CleanPod – portable, self-contained environment that provides complete control over critical processes. 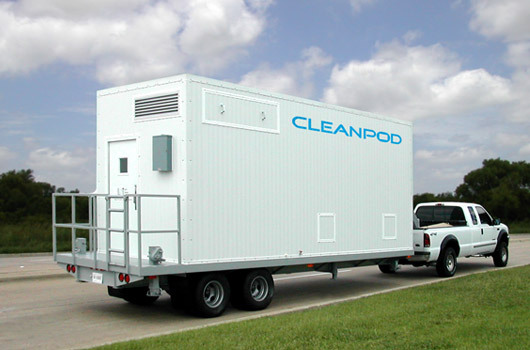 The CleanPod is a mobile, self-contained environment that provides complete environmental control for critical processes. 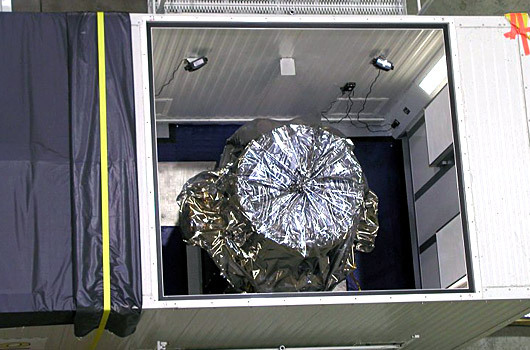 This fully-integrated cleanroom is easily deployed because each unit is lightweight and strong enough to be moved with a forklift or transported on a flatbed trailer. Just drop it off and plug it in. Outdoors, the sturdy, fully insulated walls can withstand the harshest conditions. Or use it indoors - it's made to fit through most dock doors. And there's no need to knock down walls, rearrange your entire work space or invest in a permanent cleanroom. 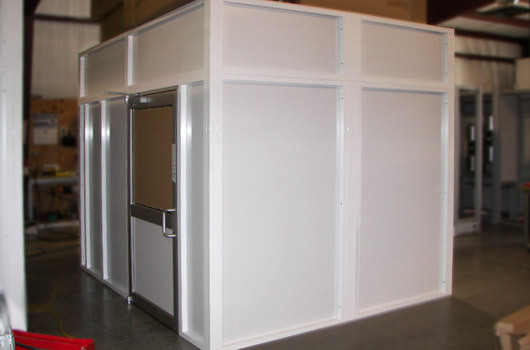 Use our standard configuration or customize the CleanPod to meet your needs. Units can be attached side by side or end to end. And the dimensions, particularly the length, may be modified to fit special conditions. Add generators and water tanks for complete self-sufficiency. 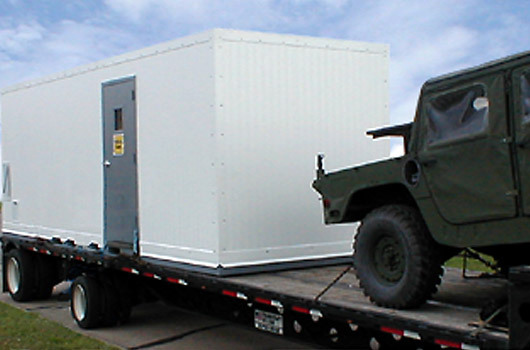 Standard and custom configured CleanPods are available in Class 100 to Class 100,000 and can meet military, semiconductor, FDA, ISPE and IEST standards. Laminar hoods, sinks, water purification systems, gas lines, and other accessories can be added to suit your needs. Attach your required utilities to the one-spot connection and you're ready to go. 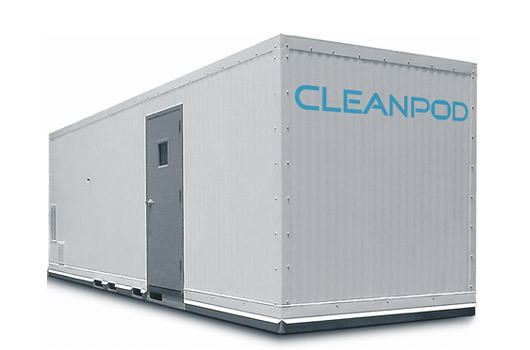 The standard configuration of a 8' x 24' CleanPod unit has two rooms with four (4) electrical 120V duplex outlets per room and two (2) wet and dust sealed light fixtures per room. Heating and cooling units will satisfy a normal heat load and maintain a Class 100,000 cleanroom environment. 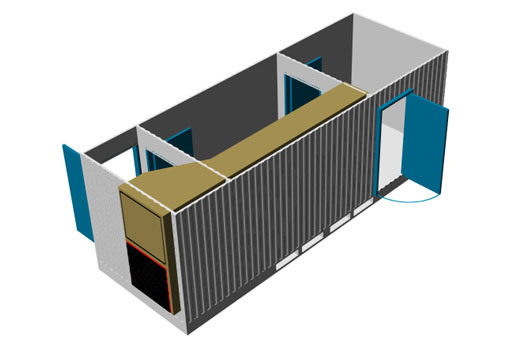 Use our CleanPod Worksheet to help determine your portable cleanroom needs. We'll get back to you with answers asap.